Mission: To close the achievement gap by preparing ALL students for college readiness and success in a global society. What is AVID? 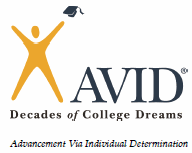 AVID is an advanced, college preparatory program for students who have the potential and individual determination to complete a pre-university course of study in high school, even if they have not previously participated in advanced courses. It’s designed for those students “in the middle” with potential – students who earn As, Bs and Cs and with average to high test scores who want to challenge themselves and strive for excellence. What kinds of courses do AVID students take? Students in the AVID program take the courses in high school that will allow them to meet the requirements to be accepted to and prepared for college after graduation. Though an individual schedule is custom built for each student in consultation with their teachers, counselor and the student, students in the AVID program typically take honors, pre-AICE, AP, AICE and Dual Enrollment courses. AVID students also take the AVID Elective course each year. What will we do in the AVID Elective class? The AVID elective is a family of students who work as a team to learn the skills it takes to be ready for college. Students participate in college research, learn organizational and goal-setting strategies, do team building and learn what it takes to be a college student! Students also participate twice a week in tutorial study groups where college-age tutors assist students with their academic subjects. What is an AVID student like? An AVID student is one who has the aspiration to attend college after high school, who is willing to challenge themselves with rigorous academic classes to prepare, who has the determination and drive to persevere when challenged. AVID students are expected to complete assignments and study outside of school, to keep themselves organized and to earn good grades in their rigorous classes. How do I apply? We are so excited you are interested in challenging yourself with the AVID College Prep Program at St. Augustine High School! The application deadline for the 2017-2018 school year is February 10th at 11:59PM! The AVID Application can be found clicking here. Students must also submit a copy of their most recent report card and have four (4) of their teachers submit a recommendation form (listed in the left hand margin of this webpage under “AVID Documents”). We will contact all applicants to schedule interviews at their middle school in January. Report cards and recommendation forms should be sent to SAHS, Attention Mrs. Herrera-West, SAHS AVID Site Coordinator. The mailing address of SAHS is 3205 Varella Avenue, St. Augustine, FL 32084. If you have any questions about the AVID College Prep Program please contact Mrs. Herrera-West at [email protected] or (904) 547-8530 and leave a message for Rachael Herrera-West.